Beat your flying phobia in just three sessions! Welcoming enquiries from Watford, Amersham, Chesham and Chorleywood. Do you struggle with a flying phobia? You are not alone! A fear of flying affects about 1 in 5 people. Very often, weeks or even months before the flight, you will have begun to fear that flight. Just the thought of it can lead to heart palpitations, sweaty palms and the mental rehearsal of all the things that could possibly go wrong on the flight! This fear can be anything from a managable niggle but one that you would rather not have to suffer, through to a full blown terror response that interferes with travel plans and limits your life. A fear of airplanes may prevent you from going on holiday, or visiting friends/relatives abroad or it may restrict you in your career as you may avoid work-related flights. 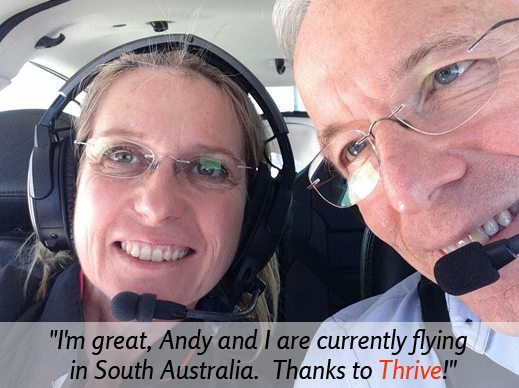 Many people experience some feelings of trepidation about flying, but if yours is overwhelming and you would like some help, the good news is that The Thrive Programme is an excellent treatment for fear of flying. Just three sessions are all that’s required to help you overcome this fear and even enjoy flying! A fear of flying is the result of simple thinking errors, such as mis-using our imagination to expect the worst, eg, imagining having a panic attack on the plane or the plane plummeting out of the sky. Thrive is a revolutionary and powerful training programme that helps you to understand your beliefs and your unhelpful thinking styles that are causing the fear. Once you have that insight, it can be very easy to think differently and regain control of your thinking and emotions about flying. The programme consists of three, weekly sessions, although it is possible to speed up the process, if necessary. I felt a real sense of calm prior to and during each (flight). It was honestly like a weight had been lifted and flying has become a truly enjoyable, and relaxing experience again! To find out more or to book your sessions, simply call me on 07740 781 573. If I’m with a client, you can leave a confidential message on our answer phone and I will return your call as soon as possible. Flying phobias treated in Rickmansworth. Close to Watford, Amersham, Chesham and Chorleywood.